Red spider mites are miniscule sap suckers, which attack and damage a wide range of plants, mainly indoors. They are very difficult to see with the naked eye. Despite their name, red spider mites – also referred to as greenhouse or glasshouse spider mites or two-spotted mites – are more commonly yellow, orange, green or brown! Red spider mites are sap suckers, feeding on all above ground parts of plants, but especially leaves, stems, fruit and any other relatively soft part of the plant. Although most commonly seen on plants growing indoors in warm, dry conditions, red spider mite will also attack numerous outdoor plants, especially during hot, dry summers. Individually, they are almost impossible to see with the naked eye – you need a good hand lens to spot them – measuring around 1mm. The orangey-red, mature females may spend the winter away from plants in cracks and crevices in walls, greenhouse frames, and just about anywhere else, including plant debris. In early spring, they find a suitable host plant and start laying eggs. 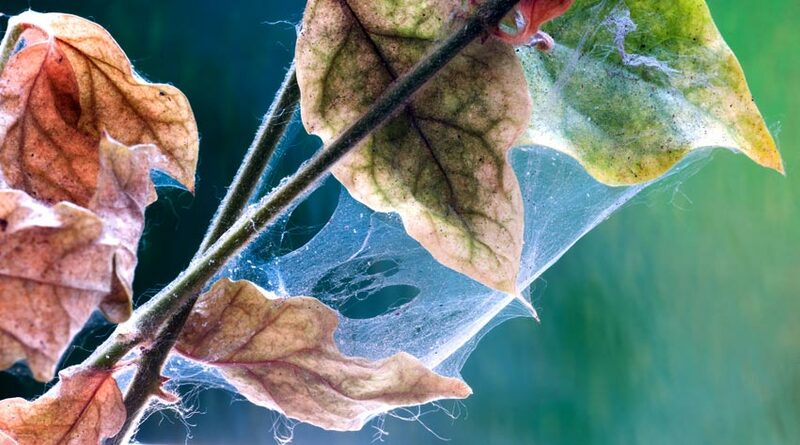 As numbers build up to heavy infestations, the mites’ characteristic silky webbing is seen on leaves and stems. This is often the first thing many people see – by which time a lot of damage has already been done. This is accompanied by shed dead skins and eggs. The webbing is often confused for a household spider web. Large, red mites often seen in summer walking over walls and paths are scarlet mites, and do not attack plants. Being sap suckers, red spider mites extract sap from the plant by using their piercing mouthparts. Even quite small infestations can cause reduced or stunted growth – especially on young plants. Well-established plants may not be severely damaged, but can be significantly weakened. Their feeding causes a mottled, discoloured and distorted appearance. As they tend to cluster together, they can seriously damage areas where they congregate and, if on the leaves or fruit, will cause premature and heavy leaf or fruit fall and even plant death. As they feed, red spider mites excrete a sugary, sticky substance, known as honeydew, which drops on to the stems and leaves below where they’re feeding. This may make the plant sticky, but rarely attracts sooty mould. Red spider mites breed very quickly in summer, in warm, dry conditions, and just a few can quickly get out of hand. Once numbers build up, control becomes more difficult. When large numbers are present, more damage is done to the plants, and this will affect your plants more severely. So, it is important to check plants regularly, and dealing with any you see – as soon as you see them. 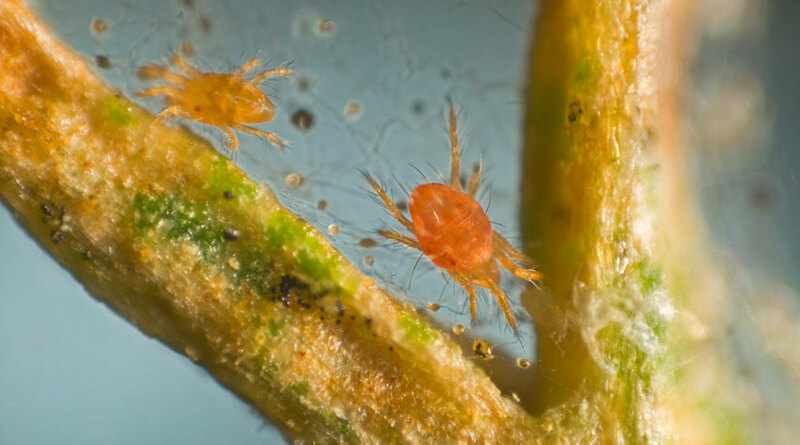 As you can’t really squash or effectively remove red spider mites from plants, remove and destroy the plant parts where they are congregating and feeding. In the greenhouse or conservatory, red spider mites can be controlled using the biological control, based on a specific predatory mite. Take affected indoor plants outside, isolated from other plants. The cooler conditions outdoors may slow down their rate of reproduction. Spray leaves and stems with a high pressure of pump-up sprayer to try and recue infestation. This is highly unlikely to give good control, but will reduce numbers present, giving more chance of success from other methods of control. There are numerous chemical insecticides available that will kill soft-bodied insect pests, such as red spider mites. The majority of these are what are known as “contact” insecticides. That is, you have to spray the actual insect (make contact with it) to kill it. If you miss some, or others land on the plant after spraying, these will not be affected and will carry on feeding, breeding and building up the mite numbers. Also, most are based on “organic” or “naturally-occurring” materials and have very little persistence once sprayed on to the plant. This means you have to spray regularly – which could be as often as every couple of days in a warm summer – to stand any chance of controlling them. Contact insecticides may not penetrate heavy infestations of webbing to get through to the mites, and so may not be very effective. A systemic insecticide (BugClear Ultra) – which also kills on contact – is absorbed by the leaves and moves all around inside the plant, so will control future attacks from insect pests, for up to two months. Spraying affected deciduous plants with a winter tree wash may also help to kill mealybug. As red spider mites prefer a warm, dry atmosphere, damping down greenhouses and other methods of increasing humidity around plants will help reduce attacks. Always clear away fallen plant debris and sterilise greenhouses and other structures in autumn.